…and I hope YOU’LL be in it! I spent Saturday in fabulous company – with 34 other authors, a squad of helpful “Volunteens”*, bucketfuls of wonderful readers, and the amazing staff at the Palmer Branch of the Easton Public Library. It was YAFest and it was spectacular! I cannot thank the lovely Cyn Balog and Jennifer Murgiaenough for all their work arranging this event. I was lucky to be seated with Alecia Whitaker—and the two of us spent much of the day just admiring how well organized this event was and saying how happy we were to be a part of it. See? This is my happy look! Aren’t they pretty? The book is even PRETTIER! 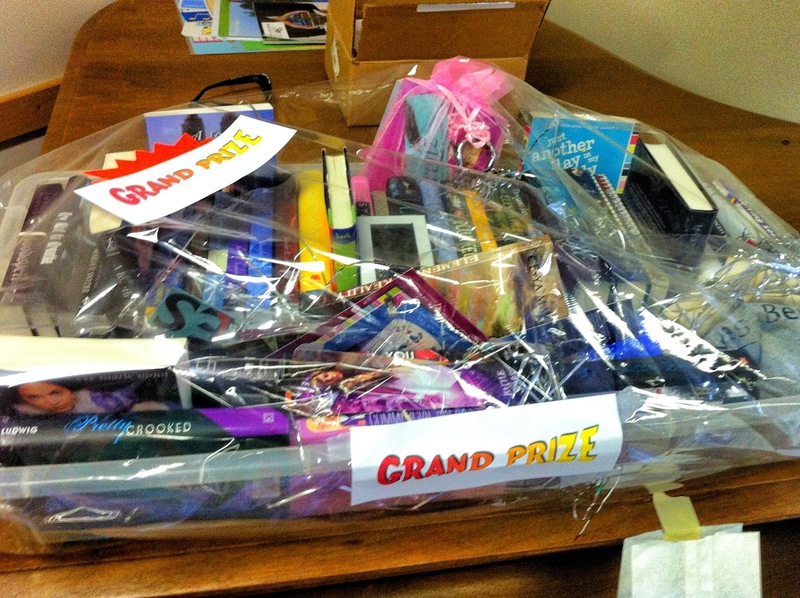 And just when I thought the day couldn’t possibly get any better – I won THIS in the raffle. It was so heavy, I needed help lifting it even AFTER I’d given away stacks. I’ve created two prize packs with the books I brought home — enter to win them using the Rafflecoptor below. Since these packages are going to be HEAVY and postage gets pricey, I’m going to restrict this contest to U.S. entries. **YOU AND ME BOTH, CHICKADEES. The Schmidtlets have informed me I can’t give away the Tupperware bin & tinsel — or, as they like to call it — their Disco Bobsled. Send Me A Sign – Cover Reveal! When I was a wee little implette, I was the child who made you stop and admire her shoes, or cluck over her band-aid, or examine the worm crawling across the driveway. Look! was one of my first words, and I used it frequently. LOOK! LOOK! LOOK! 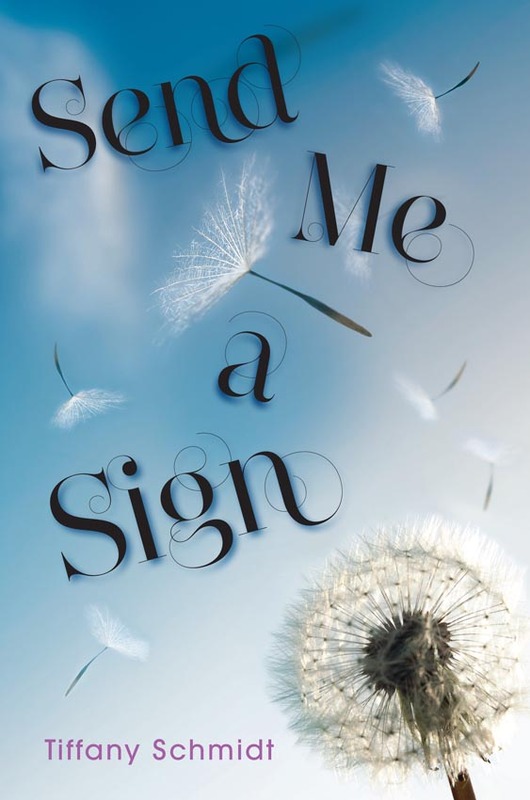 It’s the cover for SEND ME A SIGN. Do you love it? I do! It captures the wistful whimsy so well. And with all of Mia’s superstitions, I can make lists and lists of the wishes she’d make if that dandelion were in her hands. Today my only wish is that you like the cover as much as I do! And that you enter my contest, of course. 3 – Send Me A Sign bracelets. Aren’t they gorgeous?! — The talented Mindy Kuen made them for me — click here to order your own. To enter, please fill out the form below. You can earn extra entries by tweeting about the cover, liking my Facebook page, or adding the book to your GoodReads account. This contest is open to North America only (sorry!) but feel free to cover-gush no matter where you live.